Our extensive toy cabinet is a beacon of light for the children who enter our door. The toy cabinet offers an escape from treatment and a way to reconnect through games, puzzles, crafts, toys, and more. Children battling cancer and their siblings are encouraged to choose a brand new toy from the cabinet. Toys are also given to children in their new family care packages. 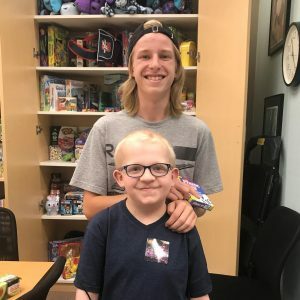 In efforts to keep our toy cabinet stocked, we encourage you to follow these lists of what works best with children who have long trips to treatment or hospital stays in a small room. Plush animals and dolls – these can be difficult to clean and can be hazardous to children in treatment with compromised immune systems.